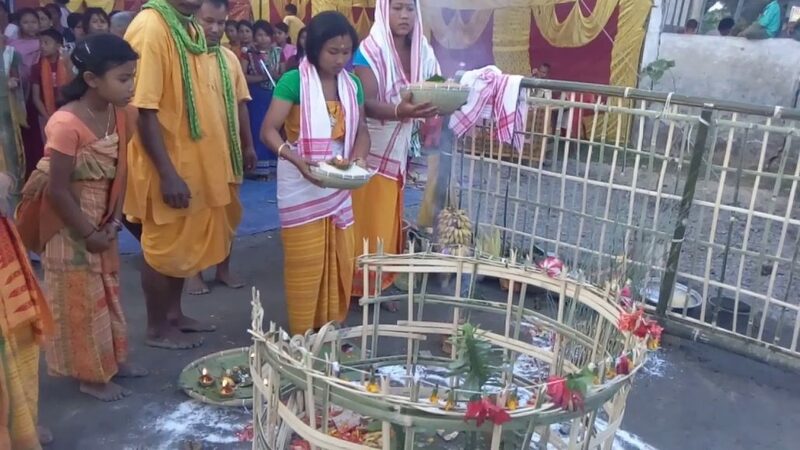 Along with other parts of the state, Laxmi Puja was observed with traditional religious pomp and gaiety on Wednesday seeking divine help from the goodness of wealth in Kokrajhar district of Assam. Locals thronged the Kokrajhar market to buy essentials for Laxmi puja since early morning. Public places apart from the households also wore a fresh look for Laxmi puja. The people of Bersogaon village of Kokrajhar have been observing Laxmi puja with Bodo traditional religious manner. Bodo traditional Garja and Bathou puja were observed coalesce in the Laxmi puja. Talking to Northeast Now, the village head man said that the people of the village have been observing the goddess of wealth, Laxmi since 1992 at the Garja Temple of the village. During the time of full moon they implore to Laxmi devi where Bwrai Bathou and Garja of Bodo tradition are also performed alongside. All the public of the village gathered at the temple and prayed for bright future and development of the community.